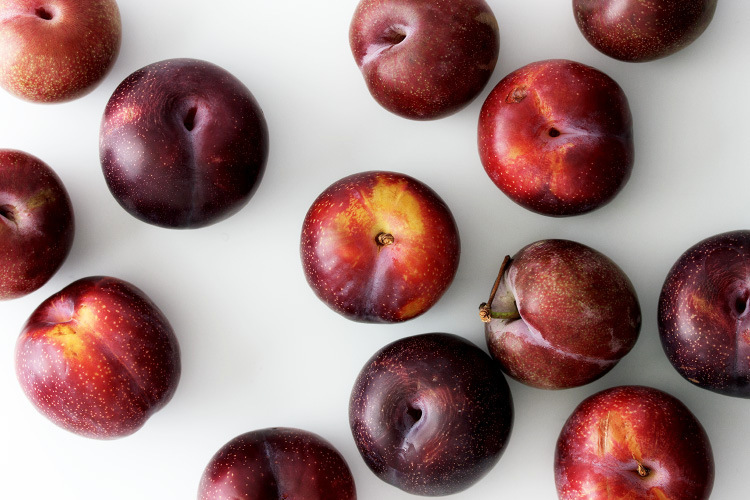 The first flush of plums appeared at the market last week and, while I normally try to maintain a veneer of cool, I was so obviously excited that a woman choosing fruit next to me turned and said, “It looks like we’ve both been waiting for this moment for quite a while.” She was right. I bought three different kinds and then the waiting game began. Firm as golf balls when I brought them into my kitchen, the race was on to see which would ripen to yielding perfection first. The blood-red plums you see in the photo below seemed like they would be first across the line, though by the weekend they still weren’t quite there. That’s the utility of this recipe: you can roast a slightly underripe plum and will push it over the edge into sweet and tender territory. You’ll notice that I avoid adding the usual woody spices like nutmeg or cinnamon. I think they’re a distraction and tend to overwhelm the fruit. All I do is provide some gentle contrast, both in flavour and texture, to lift the plum up onto its rightfully deserved pedestal. Ginger is the perfect match for plums, its subtle heat and slight sourness sitting perfectly with their rampant sweetness. Equally subtle in their own way, but providing serious crunch: a coating of flaked almonds, toasted by the oven’s heat. A little honey can be brought into play if your plums aren’t as sweet as you’d like, as is the case if they’re not 100% ripe, so use as little or as much as you’d like. In a nod to a more traditional crumble topping, I use ground almonds as well as flaked; if you don’t have both to hand, you can simply crush the flaked ones up with a rolling pin. I think a dessert like this should be rustic and off the cuff, so even though I offer you weights and measures, your eyes, hands and taste should be your ultimate guide. These don't need an accompaniment, but this is dessert so need doesn't enter into the equation. Cream, ice cream or yoghurt all work, and on cooler nights it has to be my vanilla pouring custard. Grease a small ovenproof dish, one which will accomodate all the plums snugly, with butter. Cut the plums in half and remove the stones. Place them in your dish, cut side up. Drizzle with the honey and scatter over the ginger. Roast for 15 minutes, or until the plums have just started to give up their juice. Remove from the oven and dot the plums with a little butter. Sprinkle with the ground almonds first, followed by a layer of flaked almonds. Return to oven and cook for a further 10 minutes (though you should keep an eagle on them from the 7 minute mark, as almonds can go from pale to burned very quickly), until the almonds are golden brown. Serve with some of the syrupy juices from the dish.